When our clients aren’t sleeping well at night, it can slow or even halt their therapeutic progress. 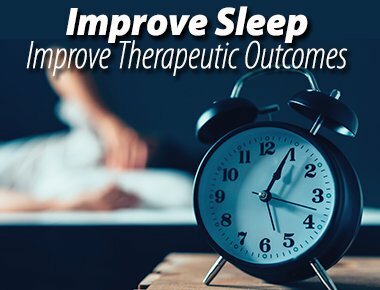 But there are safe, natural and holistic approaches we can use with our clients to promote sleep and help get our goals back on track. For example, did you know that cherries stimulate the production of the sleep hormone melatonin? When we increase our client’s melatonin intake in the evening or early evening, we can help them sleep throughout the night. Boosting melatonin is easy, and delicious, with this easy-to-make Cherry Smoothie Slumber recipe highlighted in the following video. Get your FREE Cherry Smoothie Slumber recipe today! Want to learn more? Don't miss our Certificate Course in Nutritional and Integrative Medicine for Mental Health Professionals. Through 13 comprehensive video modules you'll learn the principles and strategies you need to add the power of nutrition, diet, and digestion to your clinical toolbox — forever changing your approach to client care and enhancing the efficacy of all your other clinical methods. Leslie Korn, Ph.D., MPH, LMHC, is a renowned expert in two interrelated disciplines: Integrative Medicine and nutrition for mental health, and Cross Cultural Psychology and Counseling. Her humor, breadth of knowledge and style of presentation make her seminars exciting and practice-changing. She has over 40 years of experience as a clinician, educator and research scientist and has worked in urban and rural settings with diverse communities including Latino/a and Native communities. She lived and worked in the jungle of Mexico for over 25 years where she directed a public health clinic working alongside traditional healers and also had a successful private practice for 15 years in Boston where she introduced somatic psychotherapy and yoga at Harvard Medical School in 1985. Dr. Korn has a dual doctorate in Behavioral Medicine and Traditional (indigenous) Medicine, and a Masters of Public Health from Harvard School of Public Health. Dr. Korn also earned a Masters in cross-cultural health psychology from Lesley University where she taught for 20 years. She was a clinical fellow and instructor in psychology and religion at Harvard Medical School ,the former clinical director of the New England school of Acupuncture, Faculty at the National College of Naturopathic Medicine. She is an approved clinical supervisor, a licensed mental health counselor, and was a Fulbright scholar in Mexico and an NIH-funded scientist conducting research on massage and Polarity therapy, Dr. Korn is the author of Nutrition Essentials for Mental Health: The Complete Guide to the Food Mood Connection, Eat Right Feel Right: 50 recipes and Tips to Improve Mood, Sleep, Attention & Focus, Rhythms of Recovery: Trauma, Nature and the Body, The Multicultural Workbook, Preventing and Treating Diabetes Naturally, The Native Way and the forthcoming The Good Mood Kitchen. Dr. Korn is core faculty and fieldwork supervisor in mental health counseling at Capella University and maintains an international clinical consulting and coaching practice for clinicians and their clients.